We have the super cute and talented Heather Campbell guest designing for us today. You might know her as a newly appointed Go-to-Gal for Paper Crafts magazine, I've come to know her work as fun and cute and she has the personality to match! And plus her designs are always impeccably well executed! We are so fortunate to have her join us this month! Please give her a warm welcome and visit her blog! Hi everyone! I'm so excited to be here today as the Mama Elephant August guest designer. I absolutely adore Mama Elephant stamps, so this an absolute treat! The first card I have to share today uses Message Bands. I sometimes struggle using patterned paper and am always looking for stamps that will allow me to incorporate it into a card or project. Message Bands is the perfect stamp for this! To make this card, I simply trimmed my patterned paper at an angle and then stamped Message Bands across the card at the same angle. Then, I just accented it with coordinating enamel dots. This would look equally cool with stamping below it too! 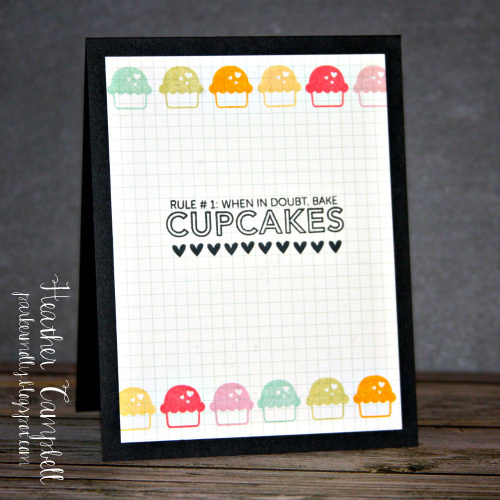 Next up is a card using the new Foodie stamp set. That little cupcake had me at hello and the matching sentiment is just so perfect! I stamped the cupcakes along the top and bottom of the card and then the sentiment in the middle. I also pulled out that little heart, which is seriously the perfect little heart, and stamped it repeatedly along the bottom of the sentiment. Thank you so much for letting me join you today! I hope you have a great day! Cute! Love the bright colors. WOOOOOOOW! Heather has knocked my socks off! These are super cute cards! LOVE the colors for both <3 FAB x100000! 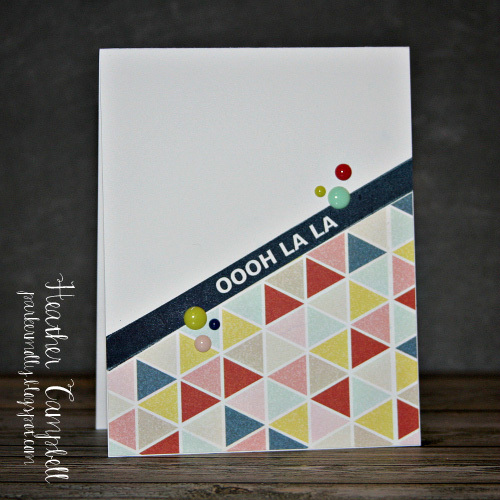 Love your cards, Heather...such a fun way to use your Mama Elephant stamps!